Recording Asheville’s homegrown hip-hop is one reason Ben Gradison established D-Street Studios in 2010. Though he wasn’t well-versed in the genre, he learned quickly that the music is much more than just rhythms and rhymes; it’s a refuge and a way for youth to relate to difficult circumstances. That’s why he hopes his commercial success will bankroll his ultimate dream: a network of community recording studios designed to spread harmony around the globe, from Asheville to Africa. “It’s always been clear to me that music is a powerful vehicle for knowledge and wisdom,” says the former assistant grade school teacher. 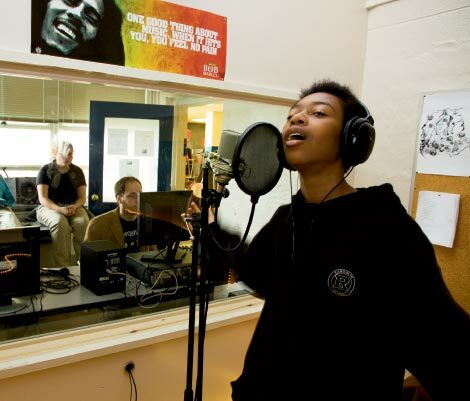 In 2011, Gradison collaborated with LEAF in Schools & Streets to launch One Mic Recording Studio at Asheville’s William Randolph School. He provided the equipment and recording know-how to give the students—many from low-income families—an outlet for creative expression and a peaceful place to congregate. This year, more studios are in the works in Atlanta, Washington, D.C., and at the Urban Arts Institute in Asheville, which advocates artistic expression among youth to reduce possible gang activity. Gradison’s efforts are global too. Last year, he accepted a friend’s invitation to visit and record Colombian hip-hop at a center south of Bogota that promotes peace. The sessions produced an album, Nuestra Alternativa (available through iTunes), but his prime objective was to set up a studio for the community and teach residents how to use it. Proceeds from the album’s sales will fund the studio. The success in South America inspired him to create more recording rooms abroad. Gradison recently returned from a trip installing equipment at an arts center in St. Thomas, Virgin Islands, and plans to do the same in Tanzania and Kenya this summer. Though still in its infancy and dependent on charitable donations, the program has struck a chord for unity. It costs $2,500 to create a new studio in the United States and at least $500 in foreign countries. Visit www.dstreetstudios.org to donate, or to purchase music to support the Colombia Studio Project.